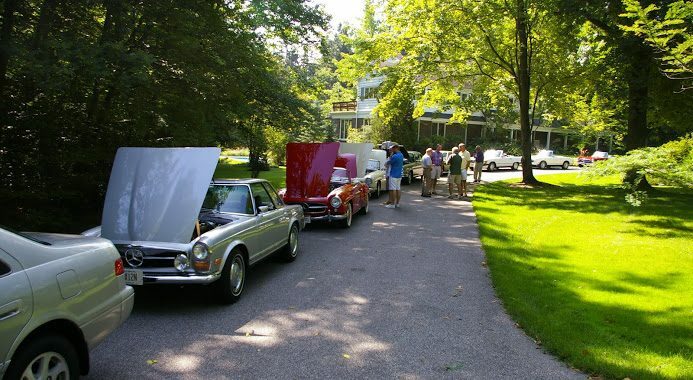 Our 12th annual Old Car Fun Day will be hosted by WRS President Rod Thompson (3175 Roundwood Road, Hunting Valley, Oh 44022) on Saturday, August 4th. The event will start at 11:00 a.m. and end when the last question is answered. Since the Jaguar Club of North America has invited our club to attend their Concours d’Elegance at Ursuline College that same day and its venue is only three miles from Rod’s house, those members who would like to visit that car show should plan to arrive at Rod’s home by 9:30 a.m. and caravan to the Ursuline College campus (2550 Lander Road, Pepper Pike, OH 44124) where we will park our cars in front of the tennis courts just inside the driveway on the left side. We will spend 90 minutes displaying our cars and viewing the car show. Coffee and donuts are available for purchase at the show and we will depart and return to Rod’s house at 11:00 a.m. We will not have to register our cars in the show nor will we have to pay the $15.00 entry fee. Our OLD CAR FUN DAY event will focus on Mercedes-Benz models of the 50s, 60s, and 70s, but all years and models are welcome. The event provides a forum for owners and enthusiasts to meet each other and chat about their experiences as drivers and owners of older M-Bs. if you have a question or are experiencing a problem with your car, this is a great opportunity to get answers from the group. After lunch is served, Jim Jaworski, owner of Berea Motor Works, a repair and restoration facility specializing in older Rolls-Royces and Bentleys, will discuss the complexities of rebuilding fully alloy engines. Jim has a wealth of knowledge about classic automobiles and their mechanical quirks. Registration is $18 per person and includes a luncheon of pulled pork & cole slaw sandwiches, potato salad, & refreshments including Oktoberfest beer and wine. The deadline is Wednesday August 1st.